If you want to be a nurse then you need to go to school. Many schools and registered nurse programs are using technological tools to delivery nursing education; especially in the area of nursing simulations. I came across one particularly interesting example of this just today. John Miller, a Nursing Professor, at Tacoma Community College in Washington is spearheading a nursing simulation hosted within Second Life. He’s also working in collaboration with the nursing school at nearby Centralia Community College. The simulator allows students to react to a situation, to choose what medications to administer, to chart their actions, to monitor the consequences, and to adjust their treatments accordingly. Scenarios can be simulated which reproduce life-threatening conditions in a safe ‘virtual’ environment. I've written about Second Life before and it seems to me with the work of simulation pioneers like John Miller, the potential of Second Life as a simulator are being slowly unveiled. I contacted John Miller in Second Life (his avatar's name is JS Vavoom) and he let me view the simulator. Here's a screen shot of my avatar lying down on the operating table. Yikes! As of late 2008, John has removed his original 5 part series of YouTube videos (listed below) demonstrating his nursing simulation. He now has new videos. I will write about them in this blog here. 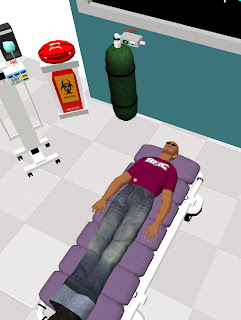 Do you want to check out John Miller's nursing simulator but you don't have a Second Life account? No worries! John has made a video tour of the simulator and posted the tour in a 5 part video series on YouTube (Part 1, Part 2, Part 3, Part 4, and Part 5). What do you think about it? Leave a comment below. PS: Take the time to check out John Miller's blog too. I would special like to thanks for the videos link which have you mentioned in your post are very nice & useful. Hi... that was great stuff.. I really like reading on this subject Could you tell me more on that... I love to explore. Your original post was back in 2008 when Second Life was just getting started. With Xbox Kinect and other devices I would expect this type of simulation has only improved. I agree with the last 2 comments. I think things like this will only get better. I remember when Second Life came out and nobody understood what it would spawn.